I read this article and found it very interesting, thought it might be something for you. The article is called February 2016 – Monthly Income Report and is located at http://www.onehourprofessor.com/february-2016-monthly-income-report/. This month I am proud to announce that I officially doubled my income from my best month ever and I’m fairly certain that this will be what the new “normal” is for me. Let me be the first to say that this couldn’t have come at a better time considering a week before all of this income came in I had to apply to a job and felt like such a failure. But, lucky for me, the big man upstairs stepped in and helped me make things happen. I can’t possibly explain how timely this was considering that I had my back up against the wall. If I didn’t start making more income on a monthly basis, there was no way that I was going to be able to continue to do what I’m doing right now full-time. But, things change really quickly when my authority website (www.JobsForFelonsHub.com) ended up going viral. I’ve mentioned previously how I created a mini course while I made this website which shows you the step-by-step process I took to create my entire website. If you are thinking of creating your own money making website, I highly recommend you check out the free mini course. This month I spent a ton of time working on my authority website and this was quite a surprise even for me. Since I’ve had the website I really haven’t done too much work myself, but the website ended up going viral and I had to make sure that I capitalized on that is much as possible. Aside from my authority website, I also spent a fair amount of time on other projects as well. How Cause-Based Businesses make You Rich: My authority website is quickly making me rich, but not in the same way that you’re thinking. This blog post explains why my authority website is so valuable to me. What to do When Your Website Goes Viral: Piggybacking off of my experience of dealing with my authority website going viral, I wrote this post which I think is really helpful not just if you have a viral website, but need to understand the basics of analytics measurement. How Facebook Increased my Traffic by 13,000 in One Week: I’d be a liar if I didn’t tell you that Facebook was pretty much the reason why my authority website ended up making so much money this month and did so well. This post outlines how it all happened and I’m sure that there are a lot of great learning points in here for you. 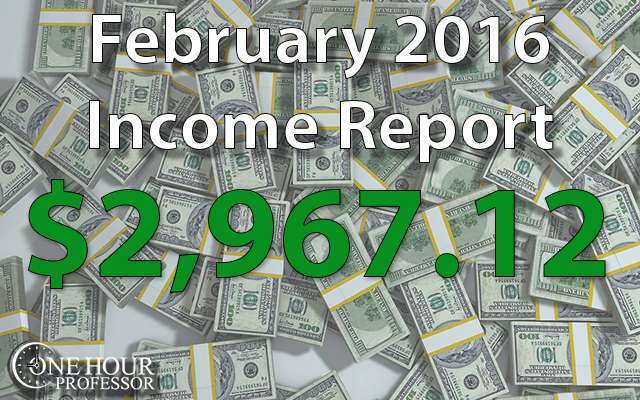 January 2016 Income Report: As always, I completed an income report and December wasn’t too shabby. Aside from blogging, I spent a fair amount of time on my new consulting website which I’ve since stopped any production on because my authority website is suddenly making me a decent income. I was originally going to share my consulting website with a lot of different people in hopes that I could get some more consulting gigs, but the truth is that I don’t aspire to be a consultant, I aspire to be an Internet entrepreneur. So, for now, I decided not to act on this any further. The next thing that I worked on was my authority website and this is because I had to redesign numerous pages, respond to emails, and I even created a job board using a plug-in that I discovered. This took me a fair amount of time, but I want to make sure that the website was as good as possible in the influx of traffic made this a priority. I’ve now begun a new authority website that is about 10x the market size of my current authority website and amazingly doesn’t have a ton of great competition. I’m not willing to disclose what this authority website is yet can I don’t want anybody to try to steal the idea, but I have a really good feeling about this one and will continue to work on it this month. Facebook | Twitter | YouTube | Google +: Next we had the typical social media time which is never a large amount of time. This month it was a little more than usual because I realized I was linking my twitter to a bunch of dead pages on my website. After reviewing everything, I made the appropriate changes to rid of those problems. General website maintenance is my catch-all bucket for random tasks that I complete throughout the month. I don’t typically detail all of these because there’s just a lot of random things that I deal with on a day-to-day basis. Not only did I increase my income from January 2016, but this month I doubled my best month ever and I have a feeling that this is going to be the norm for me know. I’m not sure if my authority website is going to bring in as much as it did this month every single month, but earnings seem pretty consistent now that my website is an viral and it looks as if these numbers could be here to stay. If they are here to stay, it’s going to be the greatest thing ever because I’ll be able to continue to invest in other projects and now that I’ve been working on this online entrepreneur thing for some time, I feel like I finally understand what it takes to succeed. LegalMatch.com: I received one lead from this website which gave me one commission for the month. MyPerfectResume.com: This is a really awesome resource that I found for my authority website. Basically it lets people create their own resume online with the use of some awesome templates and it’s a great service to help those who aren’t trained in creating resumes. YouTube Channel: My YouTube channel made the most sense ever made this month and I’m not sure exactly why that is, but I did add quite a few videos about Thrive Themes and I’m thinking that these increase my income a little bit further. Udemy: I think I’ve finally figured out this Udemy thing. It’s actually really simple, I just need to make sure that I use all of the promotional announcements each month. Consulting: I didn’t have any big consulting engagements come up this month, but all the little things add up. Indeed.com: This is the second biggest way that I generate income for my authority website. Simply put, I allow people to search for jobs on my website and when they click on certain links I get paid. Google Adsense: Obviously this was the biggest shock of the month. I guess that the lesson learned was if you have traffic, it’s easy to make money with Google AdSense. As of right now my authority website gets around 2,000 people visiting per day and it is surprising that this brings in so much money, but even $50 of revenue per day ends up being about $1500 per month. Shutterstock: I had someone purchase an image through my affiliate link here and I don’t blame them because this really is the best platform that I’ve found for website images. Aweber: As always, I got a few bucks from Aweber this month as well. You may notice that my expenses increased as well, and this is because my authority website list adds somewhere between 30-70 new email subscribers per day. Not only was I able to increase my income this month, but I also was able to decrease my expenses. I also started reviewing the numbers and realized that there were a few things I didn’t include in my original expenses of being self-employed such as my Internet, so I’ve added that in. Hootsuite: Everyone talks about social media and how important it is, but have you taken the time to look in your analytics to see how many email sign-ups or purchases social media is accounting for? In most cases, the answer is none. This is why I use HootSuite. At $10 a month and auto scheduling my posts, it’s well worth it. Comcast: I hate Comcast…so much…but they are my best choice for internet so I’m stuck with them. Namecheap Domain Names: I purchased my new Authority Website domain name this month and although I won’t explain what the website is, it’s a similar type of domain like my other Authority Website except ends with HQ. Siteground Hosting: I had to upgrade my hosting to handle all of the traffic that came in to my website this month. $75 per month is much more than what it used to be, but now I have a virtual private server that allows me to serve my website very quickly without any slow loading times. LinkedIn ads: As I mentioned previously, I had my lawyer consulting website and I tried a few more LinkedIn ads in the beginning of the month. They didn’t succeed, but this was the expense. Thumbtack Freelance Platform: I tried this platform out to pick up freelance clients as it was recommended by a friend of mine. After spending just over $100 and applying to numerous jobs, I can tell you definitively that this platform is not worth the cost. If you’re considering using this platform, just use Upwork.com and become a provider. WP Job Manager Plugin: This is the plug-in that I use to create a job board on my authority website. You can see it in action on this page in the third section. Overall I’d say that this is a pretty good plug-in if you’re looking for a job board, I didn’t have to contact my developer at all. Upwork.com: A lot of the money I spend here was focused on expanding the database that we have of jobs for felons by city and state. It may seem like a lot, but I guarantee that this will end up paying off. Done! Although I didn’t even end up using the website at all, I do get this completed. I definitely failed here, but it was a decision I made based on the fact that I didn’t need the clients after all. I may end up needing these clients in a few months, who knows what will happen, but for now I’m okay with not having new consulting clients. I was able to reduce my costs this month and that was nice, I’m going to try to do the same in March. My new authority website is going to need a ton of writing and although I already put a writer in place, it’s going to take me and her writing quite a bit in order to get enough content to be comfortable with launching the site. February brought an interesting opportunity in that the staff at Udemy contacted me to create a course. They’ve agreed that they will promote the course and I think this is a pretty cool opportunity to grow my students substantially on the you to me platform, but also be offering this course on this website as well. We are putting the final touches on the course right now, but I think that I’ll be able to get this course halfway done by the end of the month. I’m going to try to reduce costs this month as I don’t think I’ll have a lot of the weird expenses that I’ve had previously, but there will be a substantial amount of money spent on Upwork between my writers and researchers along with my video editor. Well done Ron! What a fantastic month. You should be very proud. I don’t think you’re in need of much advice right now given how well things have gone over the past month…but maybe reinvest a small amount of the money you’re making into improving the existing Jobs for Felons Hub site and updating it with new content (just so that it appears “live”)? You’ve found a winner, after all. Already have a guest blogger back on at JFFHub and I’m expanding my databases a little further. It’s been a hell of a ride, hopefully I can keep on going! Sounds like an amazing month Ron! So great your site went viral and that you DOUBLED your highest month ever. Absolutely amazing! I just found your website recently, looking forward to keeping up with you! Thanks Dave, always appreciate the encouraging words 🙂 Hopefully his trend continues and I can keep helping people while making a living, we’ll see! I like helping people too while I try to make a living. That’s why I started selling my own themes and plugins. I still have a few amazon affiliate sites, but I focus on developing WordPress stuff to help as many marketers as possible. The biggest reward for me so far is seeing so many people make money online with my stuff. Yep, no better feeling than knowing you are really helping people, that’s for sure!